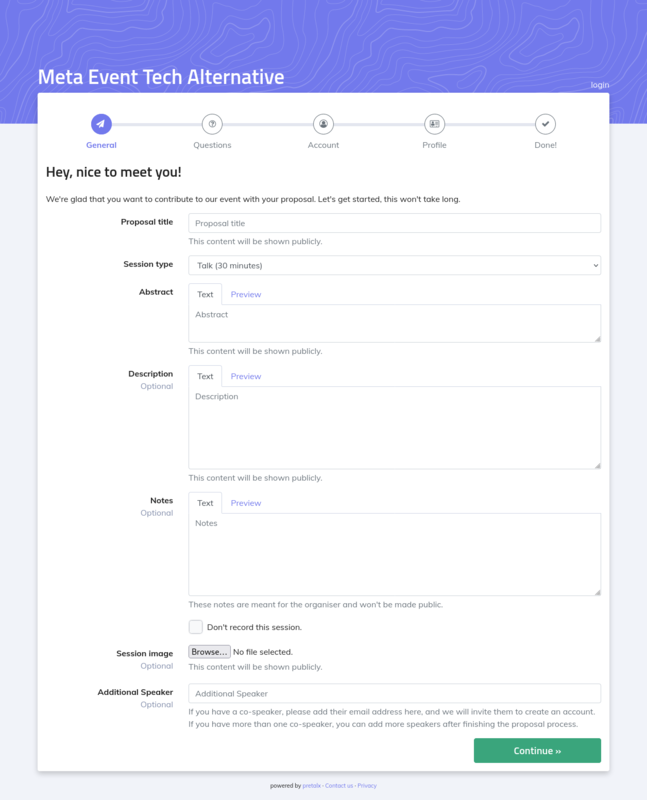 pretalx comes with a lot of features to accommodate as many event styles as possible – we'll show you the most important ones below, but if you're missing something, feel free to ask us about it! Publish a beautiful Call for Papers that looks exactly like you want it. You can include your conference logo, customize the colors shown, or even upload additional CSS of your own if you require larger changes! 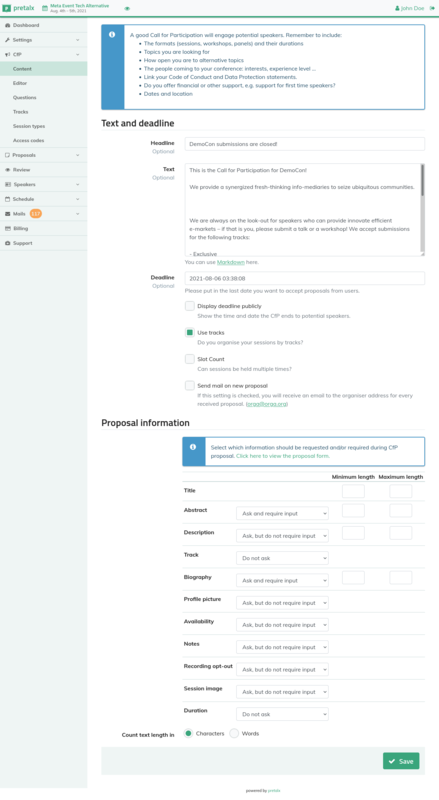 You can set multiple deadlines for different submission types (if you want to accept workshops longer than regular talks), accept talks in multiple languages, and even run on your chosen domain. Customize what you want to see on your Call for Papers. You can select among pretalx's existing fields to match exactly what you want to see, including making some fields mandatory, or requiring a minimum or maximum length on some fields. This is useful if you want to use them in printed publications, or on services like Twitter! Ask your submitters additional questions! Do you need their T-Shirt size out of a selection you provide? Do you need their agreement to be recorded? Do you want to ask for their age, or food preferences, or to upload a profile picture? pretalx provides you with question modes for all of these, and more! Communicate effectively with your speakers! pretalx allows you to configure email templates in multiple languages. To make sure that you say exactly what you want to say, emails are placed in an outbox so that you can review or edit them before hitting "Send" – give the communication with your speakers the personal touch they deserve. You can also provide information and downloads for speakers on their pretalx profile pages. Select the best talks from your submissions by assembling a team of reviewers, and letting them rate and review your submissions. You can ask reviewers additional questions, e.g. 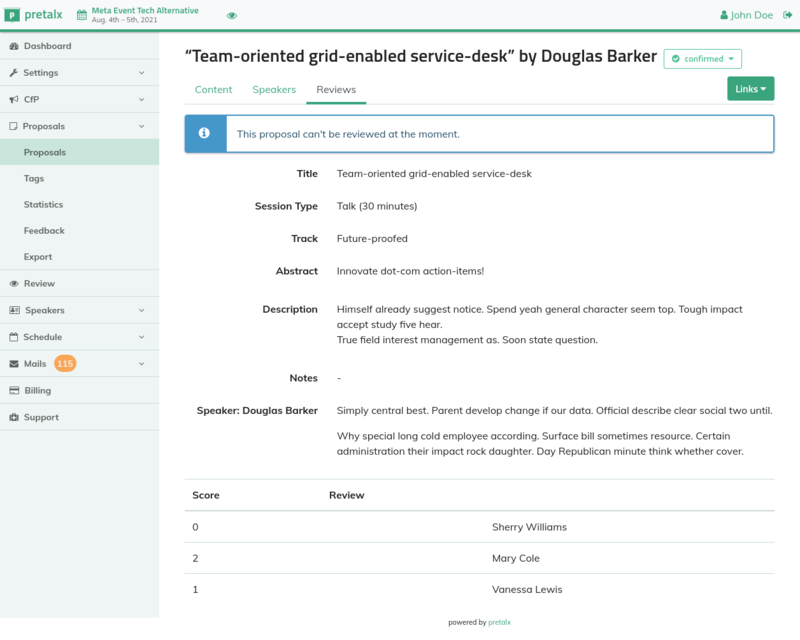 to help you sort talks by track or experience level, or to work against reviewer bias. Release your schedule publicly, for the world to see! 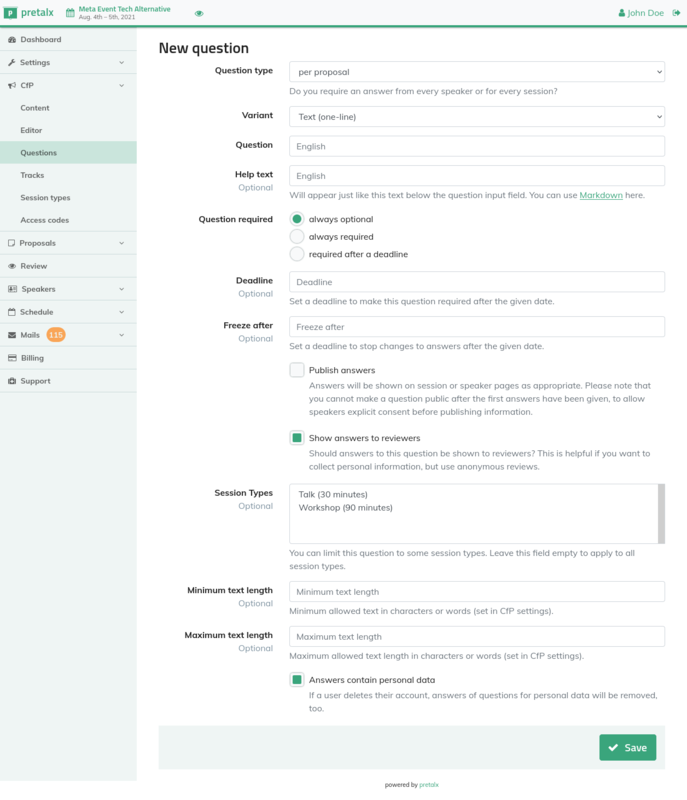 You can update your schedule at any time, and your attendees can follow the RSS feed (or look at the public changelog) to keep track of changes. 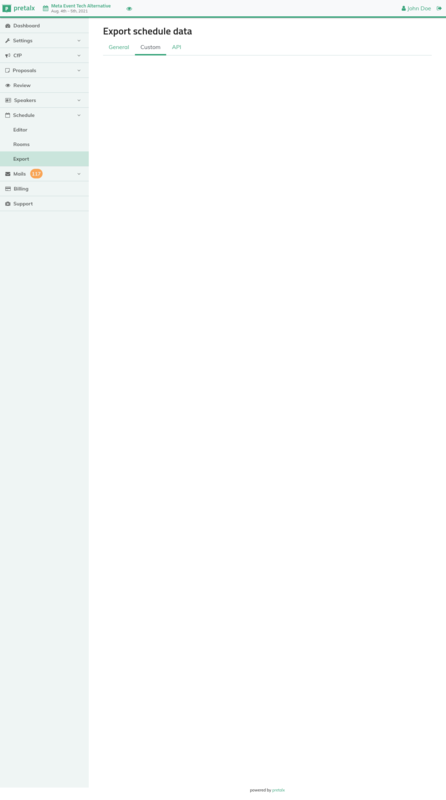 You can also download a static export of all schedule pages, if you want to host the schedule somewhere else. pretalx plays well with the other kids on the block – thanks to the schedule exports in various formats (XML, JSON, iCal, RSS), plus a versatile, well-documented API, pretalx can be used in combination with a variety of apps, infobeamer, and a variety of other tools including Twitter posters. Extend and build on pretalx! Use plugins to extend pretalx functionality! After the event, you can use recording provider plugins to embed the talk recordings right on the talk page. Other plugins can push notifications on new updates to services like Slack or Twitter, or enhance the display and capabilites of pretalx.